As far as most of us are concerned, Zambia only has one waterfalls the Mosi oa Tunya (Victoria Falls), sometimes mistaken by foreign tourists to be in Zimbabwe, well maybe two waterfalls if we include the Kalambo falls in the Northern Province which too is often mistaken to be in Tanzania. 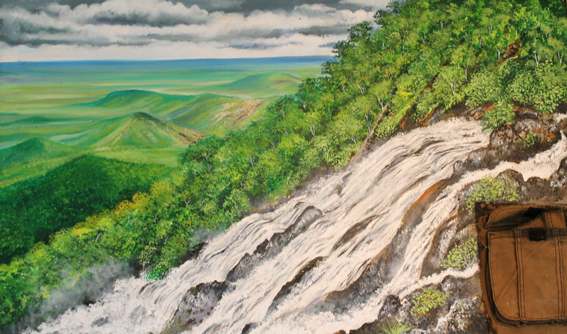 Anyhow, it turns out the country’s youngest province, Muchinga alone has in excess of 150 unadulterated cascading waterfalls, most of which are named after rivers and streams of all sizes, this is according to Lusaka-based painter and adventurer Quentin Allen who returned with some spectacular paintings of the beautiful landscape late last year after a whole year’s “rambling” in the bush as he puts it. 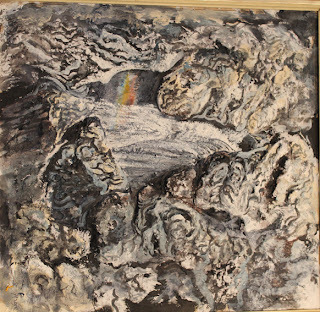 He was accompanied by another painter Mathew Mandandi who is somewhat an apprentice. “I saw at least 150 waterfalls in total, all in the Muchinga province, but we have lots more than that, that’s just a fraction of them but obviously some are not as spectacular as the others some of them like Kampoko were not full because it was before the rains” says Allen who was born in Bulawayo in 1957 and moved to Kitwe in what was then Northern Rhodesia in 1959, when his father was employed on the railways, and later on the copper mines. It was on the Copperbelt as a schoolboy where he soon developed an eye for art. When Allen, or Q as he is fondly called tells of the waterfalls of Muchinga province he does so with the infectious enthusiasm and unbridled knowledge that Dennis Liwewe exhibits when talking about the history of Zambian football such as BBC Topgear’s Jeremy Clarkson does when he talks of cars. One almost feels the urge to restrain him. “I fell down one of them (waterfalls) called Kapanda, see my scars, I landed on rocks because the water was not high. In some areas we had low water like Kalungwishi also, where you find all this green moss but some of them are on higher water like Lufisa,” says Q of the almost alien waterfalls. “There are also lovely hills, I always wanted to go up every hill, we found some rock paintings on Nchima falls, and we found a very interesting hill which is fortified, there was a wall built from stone-carved brick with no mortar which we learned was built by the Bemba’s to fend of the Ngoni raiders. Its very well done because it has lasted quite a long time,” he says. Q’s trek culminated in an exhibition at the Zebra Crossing Café in Lusaka last year which was well received if the sales were anything to go by. But like many rivers, lakes and bodies of water, the waterfalls of the Muchinga escarpment come with their own set of mystical tales. “At Nama Fongwe falls on the Luangwa River the locals told us that there is an entire village that lives beneath the water under the falls. They told us once they chopped a tree and sent it plunging in the water to test how deep the pool at the bottom of the falls was,” he says “The following day, they found the tree floating at the top of the pool with an annoyed man sitting on top of it and he was a with them because they were trying to destroy his underwater village at the bottom of the pool”. Nevertheless, Q says to get to see these captivating waterfalls and landscapes it does take a considerable degree of physical fitness because it involves long walks in rough and sometimes rocky terrain. “It involves back packing with dried foods in the bush, but then we also use a handheld GPS, Mathews used to hold it after I hopefully put in the right coordinates, because he is much better walking with it and he is a faster walker. But when we do get lost there are locals around who would give us directions and sometimes we would be lucky and be accompanied by guides,” he says. Nama Fongwe falls - Luangwa, (acrylic with tissue on board). He says they would leave a base camp with 10 days of supplies, and then walk until midday only stopping for a 1 hour lunch break this would be roughly after 30 to 40 kilometres. When they start walking again they have to find somewhere to stop at 16:00hrs before it gets dark, but the idea is to try not to walk for more than 8 hours in a day. “But then when we get to our target we stay at the camp for three or four days, because we explore the area depending on how much there is in the area to see, like Kapanda Lupili and Kapanda there were two waterfalls in the area, and even like at Kampoko,” he explains “When the season is right we feed off the land its good when its mushroom time, we saw wonderful sights of baboons and a few crocodiles, but there are no animals really they are very , very gone its sad. In the hot season you can even sleep in the open without a tent but I prefer the sleeping bag because even when the baboons come around they can’t steal your supplies”. Last year’s expedition in the wild was not Q’s first; but each year he observes a constantly diminishing population of wildlife every time he returns to the escarpment, which is beginning to worry him, but there is still hope for a few species of birds, he describes it as something of a bird-watcher’s paradise. Obviously one cannot just leave the city to traverse the escarpment; permissions have to be sought from the Zambia Wild Authority (ZAWA) or traditional rulers, both whom often provide tour guides depending on the circumstances. Q attended Art College in London and Sheffield, in the UK, gaining a degree in Three Dimensional Design and Silver Smithing. On returning to Zambia in 1979 he started the Silver Smith section of Tengu Copper Productions in Kitwe, making silver jewellery and spoons. He moved to Lusaka, where he has a personal studio at home in 1990 when working with Zuva, an off-shoot of ZCCM subsidiary ZAL Holdings. 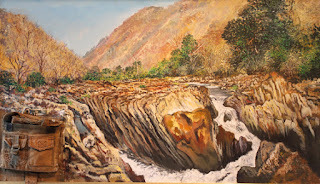 He then worked for Zambia Gemstones before going self employed as a full-time artist. 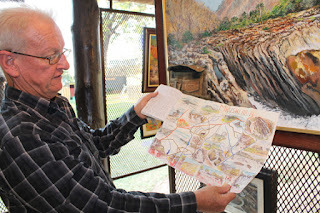 His paintings provide a multi-dimensional experience because almost each and every one of them comes complete with either a hand-painted diary or a map pinpointing the exact location of waterfalls or landscape it depicts and is inserted in the pocket of torn safari trousers that were worn on the expedition and in turn are sewn onto the canvases. Zambia Association of Musicians President Maiko Zulu’s interview with the Weekend Post’s Abigail Sitenge made interesting reading on Friday last week. The reggae artiste told the Weekend Post that the Ministry of Tourism and Arts is “slowly coming down to just a pronouncement” because it is focusing on the tourism portfolio only. And that the ministry leaves much to be desired where art is concerned. “Our arts minister has been inactive where the arts are concerned except for a few functions where she is invited and a speech is written for her,” Zulu told the Weekend Post reporter. “Our strong appeal really is that if the tourism ministry is too big to be coupled with the arts then a separate ministry should have been created, so that the arts are given the deserved attention, because right now we are busy promoting elephants and Lions, forgetting that during the UNWTO people will take away the art which is in form of paintings, music, and cultures,” he is reported to have said. Zulu is spot on with his observations but one feels it has taken too long for him as ZAM president to finally comment in this manner. However, one feels Zulu might be the wrong person altogether. It is a known fact that shortly after the realignment of the tourism ministry to incorporate the arts in July last year, Zulu and his association quickly held a gathering to celebrate the pronouncement of the new ministry and they invited the new minister, Sylvia Masebo herself. Months after this gathering, Zulu could be seen by the side of the minister whenever she made public appearances, much to the envy of other arts organisations who found it almost impossible to even seek an audience with the minister, it was clear that he had established individual rapport with Masebo. In fact, not known to be an art enthusiast outside his genre, last year he even made an unanticipated appearance at the opening of an art exhibition by young Kabwe-based artist Othiniel Lingwabo at the Radisson Blu Hotel, where again he was right by the minister’s side. In view of this presumed personal connection it becomes worrying that Zulu should come to the press to make assertions instead of calling the minister with whom he has contact, and giving her a word of advice, after all she does appear to be a listening minister. In a press briefing on the UNWTO preperations held at her Kwacha House office along Cairo Road on January 2, where she also launched one of the sample songs The Beat Is Here composed by a Mrs Mabel Zulu that will be promoting tourism before the UNWTO, Masebo categorically beckoned artistes to come out and be involved, highlighting the channels with which to do so, as well as urging artists to work as a team as this will enhance government’s recognition of the arts in industry. She stated that artistes should submit their various productions no later than 15th February 2013. In her address the minister highlighted the overall preparedness for the forthcoming tourism general assembly mentioning various projects which she had inspected with UNWTO steering committee which comprises permanent secretaries from various ministries. She declared that the commissioning of the new departure terminal at Harry Mwaanga Nkumbula airport in Livingstone will soon be announced while construction of the international arrival terminal is progressing well and will be completed before schedule. “The National Arts Council (NAC) and National Airports Co-operation have completed discussions on the creation of sculpture parks at the two airports” she stated. As much as this is good news from the minister, however, it will be interesting to monitor NAC’s commissioning procedure to see that it will be all inclusive and give all of Zambia’s finest sculptors the opportunity to participate. It is also important to note that some sculptures are quite heavy and will have to be hauled from other parts of the country, unless of course NAC has the intention of ferrying artists to Livingstone to create the works from there. Nevertheless, Masebo also mentioned the rehabilitation of Livingstone general hospital and construction of a new intensive care unit and that nine mobile hospitals will be set up at the venue. The Old Zimbabwe market has been demolished and the marketeers relocated to three places, the Scouts area, the cross-border trade centre and cooperative market respectively while the construction of a modern one is expected to commence later this month and some toilets will be constructed at Mukuni Park Trust, Old Bus Stop and the Livingstone City Council premises. Masebo announced that the site for the new inter-city bus terminus is at Villa Grounds, which has 14 hectares of which 6 would be left for sporting activities. She stated that the tender to complete the works on the Maramba Cultural Village was signed in December and will be completed in 16 weeks. Certainly, marketing Zambia at an international venue is a good thing, but as to whether the Spanish International Trade Fair is the best place does yield its own doubts. Also, it would be interesting to know in which manner we will be doing so, do we have a booth or pavilion there? Who will be on the delegation, and how well are they going to implement the publicity of Zambia as a tourist destination. Or will we be sending a delegation just for the sake of sending one? The selection and sending of relevant Zambian delegates abroad has certainly not been among our strengths as a country over the past few years, regardless of the government of the day. Last year, we were almost surely embarrassed when we sent a top-heavy entourage that outnumbered our athletes at the London Olympics, and we might ask ourselves at what cost and benefit? Similarly, last year Zambia sent a delegation to an International Participants Meeting (IPM), a precursor to Expo 2015, the universal exhibition to be held in Milan, Italy. We were told by the First Secretary Commerce and Trade on behalf of the Zambian ambassador in Italy that: "So far, we have a technical working committee comprising the Ministry of Commerce, Trade and Industry, and the Embassy of Zambia in Rome. After this meeting (IPM), the national planning committee will be constituted and it will include all relevant stakeholders." However, we still haven’t heard anything on this national planning committee as well as the so-called relevant stakeholders. At any rate, it would be good to see the end of holiday-making delegations on important foreign tours, these trips do not come cheap at the expense of the already overwhelmed taxpayer. Anyway, back to the ZAM president and his minister. Zulu, plays a very important role and he remains one of the country’s most conscious and important artistes in terms of arts advocacy as well as providing essential leadership in the sector it would be wise for him to visit with his minister and work things out, as she said at the ZAM gathering held in honour of her ministry last year, “there is work to be done”. Safia Dickersbach, The Public Relations Director ARTFACTS.Net™ Ltd a U.K. based company and leading art database and arts market analyst for the modern and contemporary art world has described TURN, the new cultural support program initiated by the German Federal Cultural Foundation as rude, degrading and patronizing. TURN is a sponsorship scheme whose aim is to develop “cultural cooperation between Germany and Africa” between the years 2013 and 2015. However, in a Press Statement following an open letter to the German Federal Cultural Foundation, Dickersbach argues that this laudable goal is gravely impaired by a disrespectful attitude towards the African side of this cultural exchange program as a consequence of political or cultural prejudices which influenced the project’s structures and funding requirements. “…the funding guidelines of the program prevent any active participation of African art institutions and exclude the artists and art communities in African countries from independently applying for the funds. The funding guidelines tell the other side of a prospective cultural exchange in a roundabout way what in blunt words would be: Sorry, but we cannot trust you, the German art and culture institutions have to first discover you, choose you and then they have to be the lead partner in the exchange, because with bookkeeping we have to rely on the German side,” reads the statement in part. In her press statement, Dickersbach also indicates that the German funding set aside for the project is insufficient and that the amount would hardly cover the costs of two or three decent art shows in any average art institution in Berlin or elsewhere in Germany as she knows very well from my professional work in the art business. “Furthermore the budget of 2 million EUR is totally insufficient to finance an artistic exchange program between Germany and the whole African continent. It would be fine to use such an amount for cultural relations with only a handful of African countries and to focus on specific regions or projects, but to take this budget and call it a "policy focus on Africa" is ridiculous in my opinion. Compared with the overall budget of the Federal Republic's state secretary for culture of over 1 billion EUR per year which includes the budget of the German Federal Cultural Foundation, the money which is designated for TURN is embarrassingly small change money,” ends the statement. And in the open letter to the German Federal Cultural Foundation, she called for a review of the TURN – Africa program in which she also appeals to the African players to demand an input of their own. It turns out since publishing her letter a few weeks ago, it has received some kind of response and some minor changes have been made. She charges that if the elite circles of the art world in Europe deal with an easy element of arts and culture policy like that, what does this reveal about the way the political decision-makers will act when it comes to shaping the really relevant policy actions for dealing with Africa in foreign policy, development aid and other questions of human survival? And in personal communication with the author early this week, Dickersbach, shared a further reaction from the person in charge of the whole programme. “After I had published my open letter with the critique of TURN, it was interesting to get to know the reaction of the German Federal Cultural Foundation and to learn about their explanations and viewpoints. Dr. Uta Schnell who runs the TURN program wrote to me that the German Federal Cultural Foundation “unfortunately is limited by statutory and administrative possibilities”, so that they could not “take into account all suggestions they might have desired,” she said. She said at this point she is wondering whether those statutory and administrative restrictions themselves are a consequence of subtle prejudices and paternalistic attitudes which we (Africans) believed to have been buried for long in the past of European-African interconnections. “Maybe not without reason Uta Schnell did not answer me any more when I asked her what exactly those “statutory and administrative” obstacles were and what changes they prevented which the German Federal Cultural Foundation would have desired to make. I did not yet experience such a case that a serious Western institution recognizes severe deficits in its program, but then gives in to unclear administrative regulations instead of immediately modifying the program and amending its faults,” said Dickersbach. Her organization Artfacts.Net is also well known for its innovative Artist Ranking System which measures the curatorial and institutional attention an artist receives and provides a ranking which is based upon each artist's relevance in the eyes of international curators. Its database consists of 25,263 exhibitors from 184 countries, 468,875 exhibitions globally, 360,334 artists biographies, 288,759 ranked artists, 25,372 works of art and 1,675 catalogues. In addition to this she owns a separate private agency since 1996 focusing on strategic and public relations advice in arts and culture. A year since his last exhibition in Lusaka, South African-based painter Geoffrey Phiri has returned on what seems to be a voyage of self-discovery, and in the process he has unearthed the “remains” of a curious, pre-historic creature he named Cownosourous. 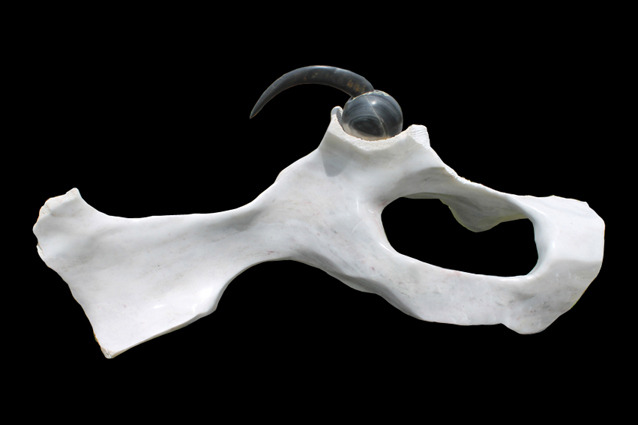 Phiri is not known for his sculptures but on this visit, he has been experimenting with marble and has just finished a piece he calls “Pelvis ya cownosourous”, loosely translated as “the pelvis of a cownosourus”. Carved completely out of flawless white marble, the sculpture does appear to resemble the remains of an animal that once lived long ago. There is nothing really exceptional about the sculpture which can clearly be categorised to have been done in the manner of top Zambian sculptor Flinto Chandia, and has flowing, organic lines that hint towards the work of David Chirwa, two artists whose work Phiri openly admires and emulates. What is interesting however is Phiri’s effort to take up the challenge of implementing something that he says he has kept bottled inside for a very long time, and looking at the final product of this creative tantrum, he can only be encouraged to continue exploring this path. Phiri’s Cownosourous is delicately carved into thin parts in some areas and it is surprising how he managed to pull it off without cracking the stone in wrong places. One of the sculptures central features is a sphere and a horn carved from black marble. Smoothed out on one side, the other side of the sculpture is left with a rough edge just for effect to show where the stone is coming from and how it has been transformed into something that is inviting to touch. Phiri reveals that Cownosorous is in fact the first of many sculptures to come and that after a two year period he might even consider having an exhibition of sculptures without paintings. “I want to do a lot of work in Zambia and part of my plans is to set up a graphics company here in Lusaka. But for the times when I don’t have any jobs or business, I will be engaged in creating sculptures. It is something I have wanted to do for a very long time, I have just been keeping it inside. But I think now is the time,” he says. Phiri is currently using the Roots of Expression Sculpture Studio in Chilenge, a makeshift space where like-minded young sculptors have been working and sharing ideas for a couple of years now, among them have been the likes of Tom and Bisalom Phiri, Kilarenz Albert, Othiniel Lingwabo and Paris-based Zimbabwean Agnew Masango. 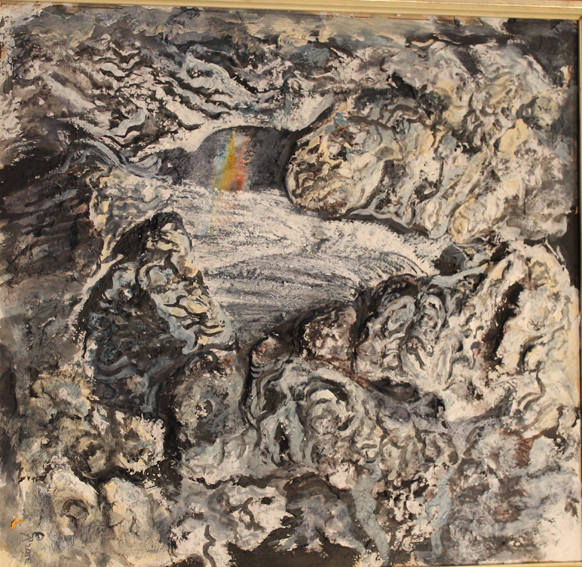 “In South Africa I will continue with my painting but here I will concentrate on sculpture. In Lusaka marble isn’t difficult to find but its just moving it from the quarry that is cumbersome. Another gamble is removing the stone from the ground because at times we use blasting or explosives so you find that the stone may have cracks in it which might render it useless when you get it back to the studio. Half way through your work the whole thing may fall to pieces,” he says. He does not have any immediate plans for his recently finished sculpture but says he will contact one of his local patrons to hold on to the piece for safe keeping. It will be interesting to see how far he will go with his new found passion and to what extent he will be able to apply the satirical wit that his paintings have been popular for, as can be seen in his 2003 work Areas Behind Our Parliament which is now part of the esteemed Lechwe Art Trust Collection. 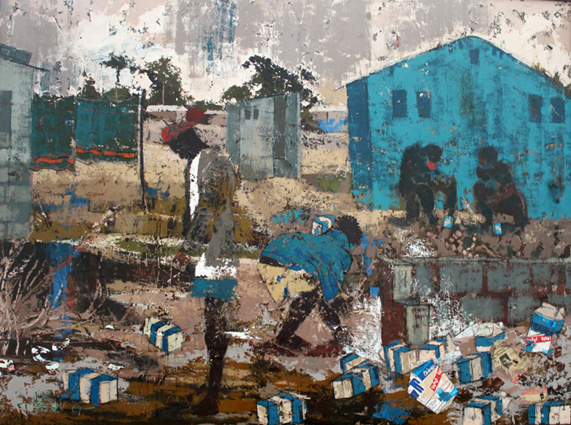 This semi-abstract painting depicts one youth urinating on a heap of discarded opaque beer containers while another is busy collecting the same items possibly for re-use. Behind them are two more consuming the beer in the comfort of a shade behind a house. Here, Phiri is poking fun at the politicians who are busy discussing issues in parliament while the youth whom their parliamentary sittings are supposed to benefit are immersed in squalor, the everyday struggle of unemployment, poverty and the abuse of cheap alcohol. It would be interesting to see Phiri borrow the militant line of thought in his paintings and apply them to his sculptures. At 38, Phiri remains one of the most emulated contemporary Zambian artists of his generation, and his influence can be clearly seen in the works of quite a number of up-coming artists. In South Africa, Phiri has been affiliated to three galleries; the Gill Alderman Gallery, the Association For Visual Arts (AVA) Gallery and the iArt Gallery on Loop Street although he works from a converted gallery space at home. As a personal inspiration, he says he has always admired Lawrence Yombwe and was at one time taunted by his peers for his early works bearing too much of a resemblance in style to the senior artist. Phiri was born in, Livingstone, after completing school he qualified to study architecture at the Copperbelt University in Kitwe but instead opted to study art. In 1997 he graduated with an Art Teachers' Diploma from the Evelyn Hone College of Applied Arts and Commerce. Between 1998 and 2003, he helped as a coordinator and researcher for the publication and production of one of the first books on visual arts in Zambia, Art in Zambia. He has also attended a number of study tours in Norway, Sweden and Holland.